Excalibur 3900B Deluxe dehydrator is one of the best food dehydrators available in the market fulfilling all your health requirements at a fairly modest price. Being manufactured by the world famous and reputed US company Excalibur, which has been on the market since 1973, this appliance offers its customers quality in a healthy, quick and best way. Excalibur 3900B Deluxe dehydrator is a dream come true for all the people who dehydrate their food regularly as well it’s a boon for families who wish to have healthy dried fruits, vegetables, meat and more in their own homes, enjoying their privacy. Owing to its quality and reliability beginners as well as professionals opt for Excalibur 3900B Deluxe dehydrator and hence it is considered as a standard against other larger dehydrators. The Excalibur 3900B is a perfect choice for your business as it is a large capacity dehydrator and hence it can manage large batches of food conveniently. Additionally it serves as a great unit for health conscious individuals who love delicious healthy snacks without added oils or chemicals. ​Following is the list of key features of Excalibur 3900B Deluxe Food Dehydrator that differentiates it from its other competitors. Excalibur 3900 Dehydrator helps in making of a variety of delicacies easily and quickly. To be specific it’s a favorite for large families and gardens. It helps in dehydrating different types of food items in a convenient manner. It dries vegetables, fruits and even jerky saving a lot of time. Making delicacies using this appliance will definitely please your taste buds. Even and perfect drying of foods is facilitated by the horizontal air flow drying system which is located at the rear of the unit. This feature prevents flavor mixing between the trays and hence a variety of items can be dried simultaneously without much of an issue. The problem of manual tray rotation is solved, all thanks to the horizontal airflow system; you can just load the trays with the required food item and continue with other work. This key feature distinguishes it from many of the large dehydrators available currently in the market. One of the very important key features of the Excalibur 3900B Deluxe dehydrator is its substantial large size. This feature helps to save your valuable time as well as it helps to dehydrate enormous amounts of food stuff in a single go. Large pieces of meat and jerky are easily dried without any hassles in this appliance making it the ultimate choice for jerky lovers. This is possible because of the 15 square feet of drying space on each one of its 9 trays. The shape of the trays is square and not round as the conventional ones which speed up the drying process. It also accommodates more food than the circular ones thus saving your time. The trays are made from light blocking- FDA approved polycarbonate ABS plastic which is superior to the regular plastic and are hence safe to use. Many of the vitamins are sensitive to light and are destroyed on light exposure. The light blocking opaque door performs the function of preventing the loss of light-sensitive vitamins from your food and you enjoy a nutritive snack. This feature distinguishes this appliance from other dehydrators in the market which come with a transparent door leading to the loss of essential vitamins. Excalibur 3900B food dehydrator is available with 9 trays which can be used as per your requirement. Depending upon the size of the food to be dehydrated, you can vary the tray number without affecting the drying efficiency of the appliance. The size of the trays increases upwards thus preventing any handling damage to the unit which can be caused while removing of the trays manually. This appliance comes with an adjustable thermostat of 105⁰F to 165⁰F. Owing to the wide temperature range, it can be concluded that this appliance is not only safe to dry jerky or various other types of meat but also preserves active enzymes in fruits and vegetables. This allows you to have a check over what you prepare, as you can set perfect temperatures depending on how quick and crisp you want your food items to be. 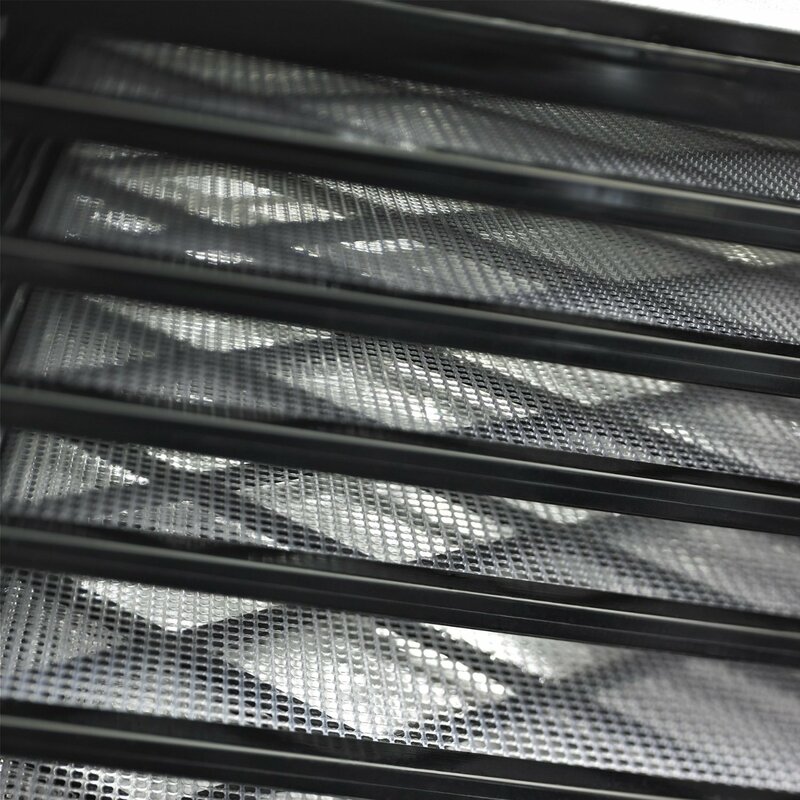 The trays provided in Excalibur 3900B food dehydrator are made up of polyscreen material. This screen basically serves two purposes, one is to prevent food from sticking and another is to prevent small food items from dropping into the spaces in the trays. Kindly make note your food does not rest on the polycarbonate tray but it sits on this polypropylene screen while drying. These sheets are easy to maintain and can be rolled up for storage. They are reusable for years. ​Technical specifications for Excalibur 3900B Deluxe dehydrator are listed below. These specifications will help you know the product better. The dimensions of Excalibur 3900B Deluxe dehydrator is 12.5’’ (Height ) x 17 ’’(Width) x 19’’’ (Dept). This size is definitely not suitable for your regular kitchen, however as mentioned earlier it’s a wish come true for large families and gardens. This appliance is very portable as it weighs only 22lbs, thus allowing easy handling and movement of the unit. There are 9 polycarbonate trays provided which help in dehydrating plenty of food items simultaneously. These 9 trays are detachable and hence can be used as per your convenience and depend on the amount of the food item to be dehydrated. The front door of this appliance does not have a hinge system but it can be lifted off entirely thus providing open access to all the trays inside. This also benefits its cleaning process making it more convenient. A drying space of 15 square feet has been provided in this appliance thus facilitating even distribution of heat and effective dehydration. This feature makes it ideal to dry large products easily without the problem of the food item remaining raw. This unit is provided with a 7 inches rear mounted fan and heating element which facilitates air blowing horizontally from the back to the front of the unit, thus allowing even heat distribution. The unit is provided with an adequate power of 600 Watt that allows the perfect drying of various food items. The Excalibur 3900 dehydrator does not have an on or off switch but is provided with an efficient and adjustable thermostat that ranges between 105⁰F-165⁰F. This range of temperature is suitable enough to dry a wide range food items from fruits and vegetables to jerky. 10 years of limited warranty period is provided by the manufacturers of Excalibur 3900B Deluxe dehydrator. There are several best things about Excalibur 3900B Food dehydrator which you must know before purchasing one. Listed below are some of the best things about Excalibur 3900B Deluxe food dehydrator. ​This appliance is the ultimate choice if you want to dry bulkier items like meat and jerky. The 15 square feet of drying space on its 9 makes it ideal for large products. You can even manually detach the trays and create more space for your food if required. ​One of the unique and best features of Excalibur 3900 Food dehydrator is its even heat distribution, all thanks to the patented Parallexx horizontal air flow system. Also supported by the 7 inches fan and the heating element, this appliance provides efficient and effective drying even in the long run. ​This is a low maintenance appliance as it offers easy cleaning with a wet cloth. The 9 polycarbonate trays can be immersed in soap solution for some time and then you can clean and reuse them. The trays are also dishwasher safe. ​The Excalibur 3900B Deluxe Food dehydrator consumes only 600 Watts of power which is negligible thus making it more economical. ​As mentioned earlier, a multifunctional thermostat is one of the best things provided by Excalibur which not only keeps the nutritive value of the food items intact along but also allows efficient heat distribution, thus satisfying the needs of health conscious individuals. ​Excalibur uses an excellent technology known as the “Hyperwave fluctuation technology” in this appliance. This technology prevents contamination of your food by yeasts and molds by making small fluctuations in the temperature set on the thermostat. Thus, it provides you fresh and healthy food for consumption. ​Excalibur provides the patented Parallexx TM horizontal air flow drying system to provide uniform drying of the food product. This system works by drawing cool air from the back, followed by its heating and then distributing it across each and every tray. This drying system comprises of the thermostat and the fan. This is one of the most effective technologies that help in effective and even food dehydration, thus eliminating the need for manual tray rotation thereby saving your time. ​Owing to the benefits provided by Excalibur 3900 food dehydrator, the price at which it is available in the market is quite affordable, especially if you are thinking of starting your own business. Numerous amounts of large food items can be dehydrated simultaneously consuming less power making it more economical. ​The Excalibur Food Dehydrator 3900 B comes with a “Preserve it naturally recipe book”. This amazing book has recipes for almost everything ranging from hot and cold appetizers, soups, salads, sauces, beverages, side dishes, and more. It also has chapters on fruits, meats, vegetables, fruits, meat, dairy products, dough art and much more. This book is an added bonus or a treat to healthy food lovers. ​Despite the various advantages provided by Excalibur 3900B food dehydrator, there are a few disadvantages too, which should be taken into consideration. Every appliance has its own pros and cons, but, that does not mask the benefits of this appliance. Below is a list of bad things about Excalibur Food Dehydrator 3900 B. ​This appliance does not have a timer. It’s a drawback as you will have to continuously keep an eye on it and hence would not be able to leave your house while it’s working. ​There is no switch to put the unit on or off which means that you have to manually work with the plug. However, the appliance has a built-in on or off system which solves the issue to some extent. ​Not all the customers find the appliance noisy; however, there are some complaints about the noise that is created while dehydration. ​Owing to the bulky size of the appliance, it sometimes makes it nonportable for the regular kitchen. Q: Excalibur 2900 and 3900 almost look the same, what is the difference between them? The main difference between Excalibur 2900 and 3900 is that Excalibur 3900 is provided with a large fan and a heating element along with an upgraded motor and thermostat. A warranty of 10 years and preserve it naturally recipe book is an added bonus. Q: Where is the Excalibur 3900B Deluxe food dehydrator manufactured? Excalibur is proud to be a U.S. (California) made product. 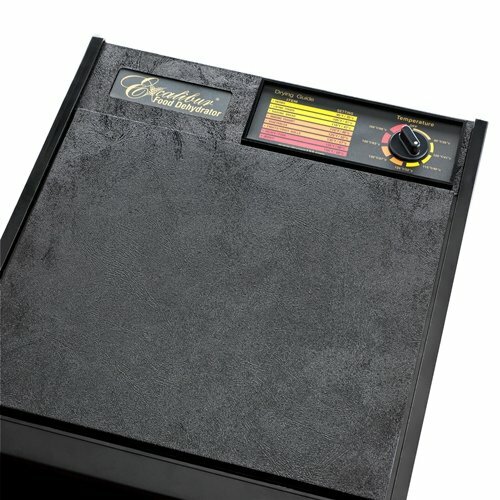 ​Q: Why does Excalibur 3900B dehydrator not come with a timer? We don’t recommend the use of built- in timers. We want our customers to buy it from a local store because you can use the timer for various other purposes and it reduces the cost of built- in timers. Built in timers also has a drawback wherein the unit is put off before your food item is perfectly dehydrated, leaving it raw. ​Q: Do I need to fill all the trays or filling only a few of them is sufficient for the dehydrator to work? 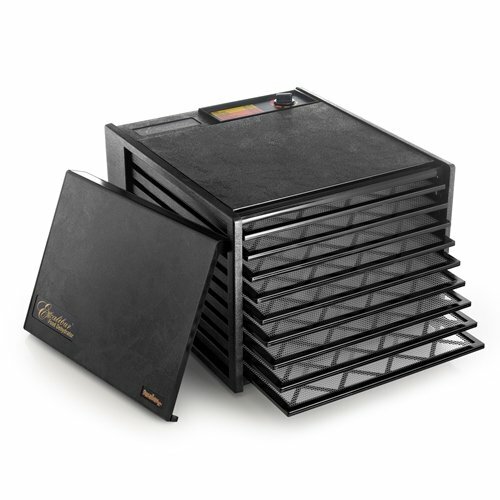 The working of the Excalibur 3900B Deluxe food dehydrator is independent to the number of trays filled. You can fill the trays partially or fully depending on your requirement, the appliance will work fine. ​Q: Is the dehydrator a green product? Excalibur home dehydrators are green products. It does not have any toxic effect on the environment and is hence environment-friendly. ​Q: Is the polycarbonate material used in the dehydrator safe for use? The polycarbonate material used in the Excalibur 3900B Deluxe Food dehydrator is FDA approved and is safe. It does not produce toxic fumes like low quality plastic dehydrators. Polycarbonate being a natural heat insulator cooks better than single- walled stainless steel dehydrators. ​Q: What is the maximum amount of jerky meat that the dehydrator can hold at a time? The Excalibur 3900B Deluxe Food dehydrator can hold approximately 4-5 lbs of jerky meat depending upon the thickness of the sliced meat. ​Q: I need to know the thickest food item that I can place, with all the trays loaded? Basically, I am keen to know the space between the trays? It’s roughly about ¼ inch and that’s a pretty good space. In case you need more space, you can remove some trays. ​Q: Can I wash the trays in my dishwasher? ​Q: Is the material used for the tray of Excalibur 3900B food dehydrator BPA free? Yes, Excalibur 3900B Deluxe Food dehydrator is absolutely BPA free and made up of polypropylene, a superior form of plastic and is totally environment- friendly. Excalibur 3900B Deluxe food dehydrator is worth for every penny spent on it and is undoubtedly one of the best dehydrators currently available in the market. It is easily available on the online shopping websites for purchase. 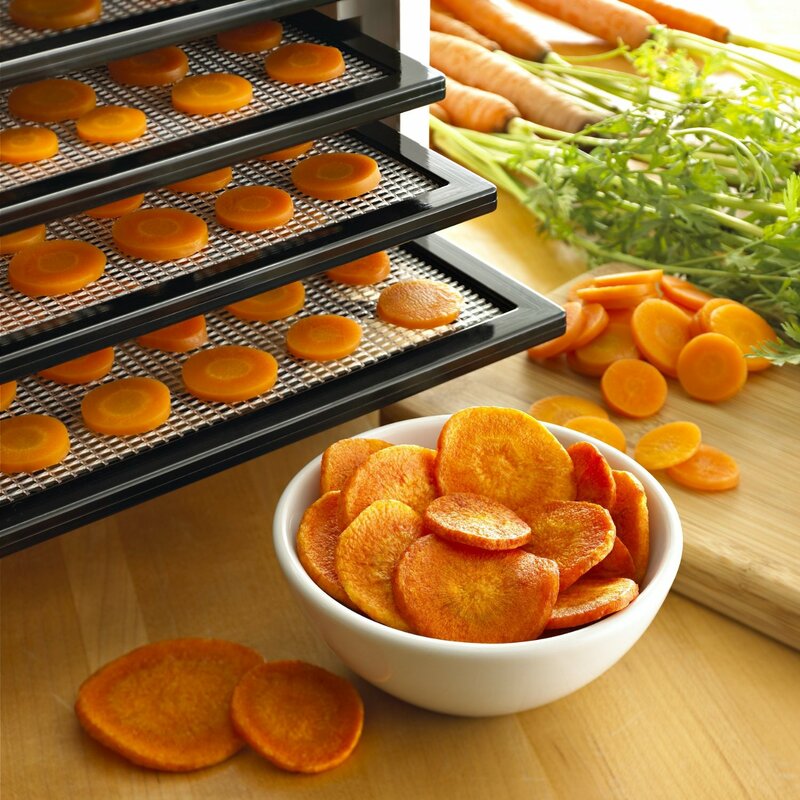 ​Excalibur 3900B dehydrator provides the fast, easy and healthy way to satisfy your taste buds. This appliance takes you away from artificial preservatives and chemicals and you experience the joy of enjoying the full potential of vitamins, minerals and enzymes in a natural way. ​To conclude, Excalibur 3900B Deluxe food dehydrator is an ideal choice for large families and businesses at a fairly moderate cost. It’s a very spacious and a neat appliance and the ultimate choice of health conscious individuals.